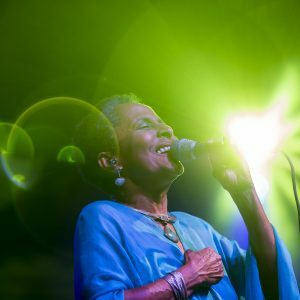 With a powerful voice and equally impressive interpretive storytelling abilities, Susana Baca is a one-of-a-kind musician, performer and an important figure in the revival of the Afro-Peruvian music tradition. She is one of Peru’s most well-renowned musicians and has contributed greatly to the international popularity of Afro-Peruvian music particularly when she came to worldwide attention in 1995, with her rendition of Maria Lando, a heartbreaking ballad of Third World worker oppression released by David Byrne on his Afro-Peruvian Classics: The Soul of Black Peru compilation.. This concert is a part of Rhythm Foundation’s Masters Series.